Rafael wants to talk with Jane about custody of Mateo. Secrets are revealed on this week's new episode of Jane the Virgin, airing Monday, November 2 at 9 p.m. ET/PT on The CW. In "Chapter Twenty-Six," as Jane (Gina Rodriguez) tries to juggle motherhood and school, she forgets to plan Lina's (guest star Diana Guerrero) surprise 25th birthday party leading to friction between the best friends. 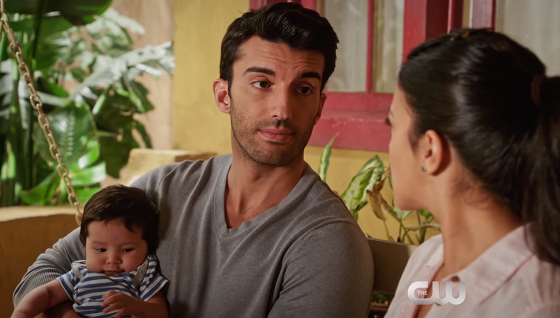 Rafael (Justin Baldoni) tells Jane that he still wants a romantic relationship with her, but she is blindsided when he asks for joint custody. Petra (Yael Grobglas) tries to enlist Michael's (Brett Dier) help to keep Jane and Rafael apart. Rogelio's (Jamie Camil) ex-wife, Luciana (guest star Kate del Castillo), is blackmailing him with secrets from years ago to get her role back on "The Passions of Santos." Meanwhile, Michael gets a new partner and a possible lead in the Sin Rostro case.